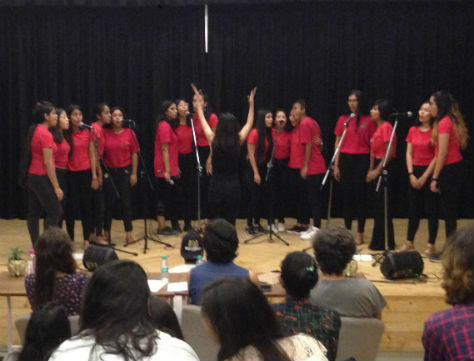 The Global Music Institute organizes first inter-college A cappella competition – Pitch, Please! 16th March, 2018: The Global Music Institute (GMI) organized its first inter-college A cappella competition Pitch, Please! at its campus in Greater Noida on 16th March 2018. The event saw participation by 10 prestigious colleges of Delhi including Lady Shri Ram, Jesus & Mary College, College of Business Studies, Shiv Nadar University to name a few. This is the first time that a music college in Delhi has organized an event of this kind. Lady Shri Ram College emerged the winner and walked away with a cash award of INR 10,000, winner’s trophy, a certificate of merit from GMI, and exclusive GMI merchandise. Apart from this, they also received a gift certificate for a 3-hour rehearsal time at the BlueRaga Jampad (equipment partner for the event), a 10% scholarship on GMI’s summer programmes, and an opportunity to attend a 1.5-hour masterclass with the GMI Voice faculty on their respective repertoire. Jesus & Mary College were judged First Runner-Up (awarded cash prize of INR 5,000) and Shaheed Sukhdev College of Business Studies were adjudged Second Runner Up. A Capella originally referred to music sung in a chapel or small worship space without accompanying instruments, as opposed to a large church where vocal music was usually accompanied by an organ. The term has since come to mean any music sung without accompaniments. Each college performed with a team of 10 to 30 students within the time span of 10 minutes allotted to them. Prior to this, they were also given a chance to take a tour of the GMI campus. The runners-up and participating teams walked away with merit certificates, trophies, and opportunities to perform and attend GMI’s masterclass. GMI has constantly endeavored to bring new experiences for its students. 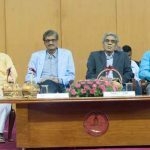 Some of the institute’s recent initiatives include a three-day event on writing, analysing, and improvisation in music; and masterclasses on various music genres by eminent musicians from India and abroad. Apart from this, students perform at select venues across the city to gain exposure and hone their skills further. GMI is the first college in India to be a member of the Berklee Global Partners, an international collaboration with the aim of developing leaders of performing arts education around the world.